“Caaaareful, caaaaareful, watch what you are doing.” Concentrating on where the spinning blade meets the board, I found myself wondering, “What the??? am I crazy? Can I really become a minimalist? Where will I keep this table saw?“ Worried about cutting my fingers off, I shut down the saw. The notion of selling the Bohnarosa and all its trappings hit me hard as I was working on a project. As the saw powers down I look around. This is my happy place; I like being surrounded by hand tools, power tools, and mechanic tools, large and small. A generous inventory of lumber sits against the far wall. Bins of sorted nuts and bolts, both standard and metric thread waiting for use. What am I considering? “Sell the Bohnarosa!! !” This is nuts, and I don’t mean metric. Growing and bailing hay, feeding horses, tractors, farm implements, and fencing. Years of coming and going calling this, “Home.” With the help of friends we planting over a thousand trees the size of pencils, and now an establishing wind break stands. Providing shelter for deer, birds, and other critters. Putting up out buildings, cutting and splitting wood for heat. Thirty-six years in development and now the daunting proposition of putting up a For Sale sign!! Cheeesse, gimme a break. Within its boundaries the Bohnarosa contains a personal history. Idea’s becoming realities, hardships blooming into beauty, years of a married couple getting better at, “Doing the next right thing.” It’s not just the compost pile that is decaying. My self is melting. I’m in Stress City. 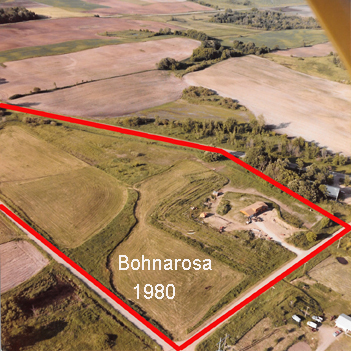 The Bohnarosa was once a cornfield; now it is a reflection of how I define comfort, safety, and refuge. I walked away from the table saw and unfinished project. The next three days required some thought and Biblical truth. It’s good to know my days are numbered. Only God knows the number. I’ve been blessed and had days multiplied by years. I’m grateful for that. So why am I anxious about going on an adventure? I mean really, how many coffee tables can you fit into a travel trailer? Seriously I stressed over not having materials at the ready. Planning and creating, tools and equipment; I take pleasure in projects and accomplishments. They represent a connection to my dad. Many of the tools were his. I’m past the table saw melt down, and working towards a very manly garage sale, not to be missed by the DIY types. My ambition to do, is morphing into, “To go”. I’m sure there will be plenty of “To do’s” along our journey. This is still the same book, just a new chapter.